She is indeed the love of your life, but do you occasionally go out of ideas on things to do with your girlfriend. Every guy dreams about how to keep his girl safe and happy. The first one which is protection is pretty much easier. But, very few guys know the mysteries to keep girls happy. Only a handful number of people know how to keep the flame of romance alive in life. There are plenty of things that you can do with her. But, is every idea fun-filled and magical? We have compiled the best ever and the most unique 103 ideas on things to do with your girlfriend. Get ready to blow her mind. Life with a girlfriend can be really adventurous and fun at the same time. To add some spice to your relationship, you can definitely take her for a walk to the place where you met her for the first time. This is a romantic idea indeed. Yes! Bring out the photographer within you. Go together for a photography session; you can hire a professional photographer always. Choose a splendid location and have some fun. If wine is both of yours one of the most favorite beverages, then this idea is totally made for you. Go to your local brewery and taste some rare wines together. It is an experience that needs to be framed forever, so don’t forget to bring your camera along. A beautiful sunrise or a sunset can stimulate thousands of beautiful memories. So, this is one the most amazing things to do with your girlfriend that both of you can definitely think of. Fix a beautiful lakeside or a nearby park, and enjoy the elegant view of sunset together. Whether you believe it or not, a book especially when it is romantic can always bind two hearts together. And no matter how old or new your relationship is, this is such a beautiful thing that you can always do with your girlfriend. There is no age of reading. A sunny day means a day when you can try all type of adventurous things. What about a bike ride? Yes! This is one of the most adventurous things that you can try with her. You would never run out fun as long as you have stunning ideas. The idea of arranging a home party is always amazing. Well! Whether you want all of your friends at the party or not, that entirely depends on you two. Having fun is the wholesome idea and you can achieve that in any way. No matter what your baking material is; it can be a cake or even a pasta. It is always a fun idea that can bring a lot of fresh aroma and romance in the air. What do you say? Did You Just Say, “Spa”? If both of you are tired of the daily chores of life, then a spa day can be one of the perfect things to do with your girlfriend. You can opt for a nearby spa parlor or you can even arrange everything at your own house. Location can be anything but the idea is definitely worth trying. Are you two gamers? Then this idea is for all the game lovers. Invite her to your home and play a tough match. Enjoy the time with a full volume of noise. Well! There are plenty of places to go together, but a pumpkin field is probably the most interesting one. The yellow picturesque view would blow your minds. Why not? A zoo visit can always freshen up your mind and can bring some amazing childhood memories. The famous movie was not made just out of the blue moon. A dance is not only a mere art form, it is an expression of freedom and joy. This is something you can always try out especially when both of you are mentally exhausted. What about a Short Trip? Read it “a short and inexpensive trip”. This is an idea that works the best especially during weekends or a short holiday duration. You don’t need to make a big plan always; a short and inexpensive trip is enough to bring back the freshness in your relationship. A fun time has no such particular definition. It can be a movie time or even can be watching a brilliant film at home together. Altogether, it is one of the worth trying things to do with your girlfriend. A short break works like a rejuvenation and especially when both of you are workaholic. Sometimes, it is necessary to take a break as well. Both of you can take an off day on a particular day and can spend some time together. No matter how bad or worse you two are in cooking, it is surely a gala thing to try. Just gather all the necessary ingredients and spices. And, make an interesting dish together. Fun, right? Exactly! Why should music be left out? Whether you two can sing or not, it is always fun to try something new and unique. List all the beautiful songs and their lyrics, and just sing them together. Often, an off-beat note can synchronize two hearts beautifully. Have You Just Said Shopping? Well! Often some debits can give an enormous amount of joy and might fill our lives with the perfect happiness. What do you say? Yeah! A home décor is a great idea that always ensures quality living and gives a high level of mental satisfaction. So, why not. This is one of the beautiful things to do with your girlfriend whenever you feel bored. People often think that candlelight dinners are always expensive. But actually, it is a myth. You can always think of all home-made components for a successful candlelight dinner. Stunning, right? An old-fashioned idea that actually never loses its charm and glam. You need two postcards and two colorful pens to make this idea workable. Write letters addressing each other and later on, read it out one by one. It is a beautiful and romantic idea indeed to express love and lust for each other. After a tiring week and a tough schedule, she might feel very exhausted. Give her a relaxing massage and make her feel that how important her well-being is in your life. Yes! This is one of the funniest things to do with your girlfriend. Take those old boring pottery wares off the shelves and give them a completely new look by painting something attractive all over the bodies. Don’t worry! It is just a fun thing which doesn’t require skills all the time. Diaries Say So Many Thing! Sometimes, to spice up your boring life, all you need is a touch of adventure. If both of you love to write things, then this is the perfect thing to do with her. Ask her to bring her diary and you also bring the same. Find the coziest corner of the house and engross into each other’s story. It is the most romantic way to explore each other. There is nothing more fun than learning things together. During weekends when both of you are kind of free, this is the perfect thing to try. Join a class; it can be dancing, painting, cooking, reciting, or music. This playful learning would not only freshen up your minds but also would provide you with plenty of time to spend together. Wow! This is one such thing that everyone loves to do. Geocaching is fun and adventurous. You need a mobile with GPS and that’ all. It is full of fun and worth trying with your girlfriend. Let the composer rise inside of you. Write and compose something a melodious for her. You might not sing well but she would definitely love your effort. It’s Time to Draw Something on T-Shirts! If both of you are pretty bored with those old t-shirts, then this idea would make you quite happy. Buy some colors and paint something silly on those t-shirts. It is awesome and you would love to do this crazy thing with her. Did You Just Say Jacuzzi? Soaking your exhausted bodies inside a private jacuzzi is definitely one of the rejuvenating things to do with your girlfriend. Well! Everyone love to know their future. Believe I or not, it is super fun. Go to a famous tarot card reader together and let the futuristic things come on your way. Make sure not to affect your life with these things. Lights, music, and dance – who doesn’t love these three things? This is a totally crazy thing to do with her. Simply take her to the nearest disco and dance together all the night. Music connects two hearts. Don’t believe us! Check out yourself. Sing out loud together at a local karaoke house. It is fun and awesome. If you are bored with playing the same old games at your home, then this is definitely something awesome both of you can try together. Go to the nearby arcade or game parlor and play some awesome games. This is definitely one of the craziest things to do with your girlfriend. Who Asked for Window Shopping? Window shopping is something that can make anyone happy. It is free from a headache or free from any payment. You should try this awesome thing with her. Yes! If there is an ongoing carnival near to your place, then you must take the advantage. Believe it or not, a carnival is the most awesome place to enjoy together. Color, food, different people, and a lot of fun – all these features describe a perfect carnival. Would You Go for a Beach Walk? Want to enjoy the symphony of nature, then go for a beach walk in the evening or during the morning is one of the perfect things to do with your girlfriend. Want to Enjoy Home Theatre? Are you eager to bring the movie hall in your house, then home theatre is something you should definitely try out together. It is full of excitement. Make sure to select a common genre that both of you like a lot. Well! We know that it is not her birthday, but you should not go after dates to share some happiness with her. Sometimes, a surprise gift can give her the ultimate happiness too. Gift her something that she would absolutely adore. When you just to spend some fun time with her, ideas should never be the blockage. You can wrap her favorite chocolate, cosmetic, or even jewelry and keep it inside a few boxes. Let her explore the pandora’s box and unwrap the beauty. Bring some charming and exotic flowers for her and let her get drenched in the beautiful aroma. It is a romantic thing to do. Is there any restaurant in your locality that has been recently inaugurated and you haven’t visited yet. It is the perfect time to visit the place together and enjoy both of your favorite cuisines. Yes! This is one of the most entertaining things to do with your girlfriend. You can throw a surprise dinner party. Arrange everything and make sure to prepare dishes that only she loves to eat. Superb idea, right? Many people just hate even the idea of a flea market, but surprisingly couples do find it amusing. In fact, this is a great idea to make your boring weekend fun and interesting. This is an absolutely modern age idea. If both of you missed some of your favorite web series or a newly released movie on Netflix, then choose a cozy weekend and enjoy the show together. Honestly, we are lazybones and thus we feel, this is one of the craziest things to do with your girlfriend. Adventure lovers find this idea amazing. Hiking or climbing is the most awesome things to try together. It freshens you up and rejuvenates your mind. Do You Know any Nearby Tattoo Parlor? Tattoo or body art is a way to express your mind. It becomes a fun thing when you are with her. Go to a nearby parlor and try out this. Both of you can try a design that complements each other on the same part of your body. It sounds fun, right? Believe it or not, it is a super fun thing to do with her. Make sure that the movies have no subtitles so that both of you try to predict the story all the time and tell each other what you have guessed. A comedy club is definitely an awesome place to rejuvenate your mind. Bring back the fun in your life. The museum is a fun place to cherish all those childhood memories. Don’t worry! No one would call you two ‘children’. Enjoy a perfect outing with her. Is it easy to explore all the parts of your city or have you done that? Well! Try out yourself. Pack some foods, water, and lather some sunscreen over your body. And, you are absolutely ready to explore your city. When you have absolutely nothing to do, this is one of the best things to do with your girlfriend. A pub is one of the most favorite places for couples. We are sure that she would love this idea. We genuinely love this romantic idea. It is a perfect plan for a perfect weekend. Sometimes, just a touch of personalization can bring a lot of depth in your dull and monotonous life. What do you say? Who doesn’t love a new look? If you can, you can give her a new haircut. Or, you can learn how to do facial at home on YouTube and try it out on her. Trust us, this is the perfect plan that every girl longs for. It’s fun, right? A silly and absolutely harmless prank can take away all your boredom and exhaustion. Give yourself a new energy with just a prank. Yes! We are damn serious. This is definitely those cutest things to do with your girlfriend. Go to a departmental store and try on clothes that you never would. Click some pictures with weird poses and cherish those funny moments later on together. Every girl loves jewelry, especially when the jewelry is gifted by someone special it makes them double happy. Woo her with a statement jewelry and tell how special she is. You can take her with you to the store as well, it would make them her happy. When you just don’t want to spend much yet want to have fun, a visit to the local amusement park with your girlfriend can be a great idea. How About a Short Trip? Well! When time is the crucial factor in both of your life, a short trip to someplace near can be an awesome idea to explore. Go to a short trip during the weekend and have a blast. Want to Have a Match? A match on Xbox or on your PS is definitely a lit idea. Trust us, she would love it for sure. This weekend, you have to download a number of movies that both of you love to watch. And, start a movie marathon. It is fun and is one of the exciting things to do with your girlfriend. Believe it or not, pizza is bae and everyone’s love of life. This is a crazy idea to try especially during the weekends. Well! There is a high chance that you are bored with the old colors of your wall. Give it a new life with some vibrant colors. Who would do that? Of course! You two. Enjoy a beautiful time together by taking a look at each other’s childhood photos and family album. This is an awesome way to spend some quality time together. Can I be Your Chef for a Day? This is one of our favorite ideas on things to do with your girlfriend. Give her one day when you would become her chef for a day. You have to prepare dishes for her. Well! Don’t worry; this is really a fun thing to try with your partner. If books are your love of life, the library must be a part of your ideas. No need to go far from your place, a small and peaceful library would be great too. No, this is a twisted idea. You are not supposed to recite any poetry, you would be given an audiobook and you need to recite a song like a poetry. Are you eager to create a beautiful moment with her? Then you can think of this idea. Make a short video capturing her moments (secretly) and enjoy together. She would be super happy for sure. If both of you are GoT fans, then this is the call for you. Enjoy the old episodes of GoT on Netflix and have a blast. Play short tag questions game with her. These type of questions are perfectly made so that the partners may come to know about each other. This is definitely one of the best things to do with your girlfriend especially when you have a lighthouse near to you. Take her there with you. Just visualize how beautiful the sight would be. What about a live theatre! This idea is awesome especially when both of you love to explore different types of movies. Sounds exciting, right? What Would You Like to Take as Dessert? A dessert is enough to melt her mood. Take her to a local place and enjoy her favorite dessert together. Table Football or the idea of Foosball is definitely crazy and entertaining. She might not agree at first but I you ask her several times, she would definitely come with you. Trust us, once she starts playing, there is no looking back. Believe it or not, it is always fun to go on a picnic with her. You can go with mutual friends or even go together only. Foods, music, and soft drinks are all you need for a fun picnic. Do you truly know everything about each other? Well! Time to ask some interesting and in-depth personal questions to each other. Know each other in the most fun way. Yes! Why organize everything prior? A surprise date night is enough to make her smile. She is precious and you should never forget that. Apple or Berry picking is seasonal though, yet it is full of fun. If you are reading this during the perfect season, then this crazy idea is perfect for you. Have a blast in the field. This is one of our favorite things to do with your girlfriend. Night camping might sound a little bit old but it is never obsolete. You would totally love this outing. Make sure you have taken the necessary measurements for your safety. Does she love pets? If the answer is a big ‘Yes’, then you can adopt a pet on behalf of her. 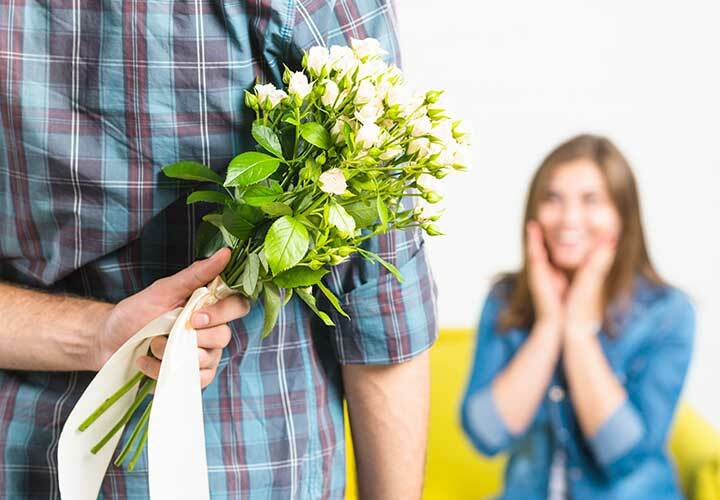 Surprise her in the most amusing way. As a pet lover, she would be speechless in joy. Do you have a festival around the corner? Then it is the perfect time to go shopping with your partner. Girls love shopping; especially when they have a purpose, the fun itself becomes triple. Well! Why should you buy your favorite drink always? Brew a beer together at home. It is fun. Yes! Some games never lose the charm and board games are such. Play your favorite board game with her and have an amazing time together. This is one of the beautiful things to do with your girlfriend. Are you freaking gym lovers, then think of this idea. Hit the nearby gym together and make a resolution to lose weight together. Isn’t it fun? It might seem an odd idea, but doing something charitable has always been considered as a noble idea. She would love it. Buy a puzzle from the market and try to solve it together at home. It is free of cost and always feel awesome. May I Know Your Bucket List? Do you know her bucket list? If not, then this is your time to know that. Share each other’s bucket list and be determined to fulfill them. Who needs expensive restaurants to feel romantic once again. Get a cozy corner of your bed and have a cuddle time together. Remember, love letters can never go obsolete. She would crazily love this idea. Write something special for her and express your love. Before you hit the bed and go to sleep, why don’t you talk something romantic? Pillow talks are indeed stressbusters and help to feel relaxed. This is one of the sweetest things to do with your girlfriend. Is there anything you haven’t told her, then it is time to share some secrets. Share all the secrets with each other and feel amazing. Have you ever seen the sunrise together? Wake up early one day and enjoy the sight. Trust us, the sight of sunrise is divine. Does she know about your favorite moment with her? Of course! Who would tell her if you don’t? Tell her how you felt at that time. Write short messages for her and let her wake up with those romantic messages. She would love this idea to the core. Guys should be innovative sometimes; make her a beautiful basket which would contain all the necessary things she loves to use daily. Surprise her with a cute message attached to it. Isn’t it one of the cutest things to do with your girlfriend? A long drive always works as a rejuvenation mantra. Take her to a long drive wherever she wants to go. This sounds really romantic. Are you love trying out DIY crafts? Then this idea is dedicated to you. It stirs your thought process and makes you feel superb. Have you ever crashed into a wedding? Then this is your cue. Challenge each other, who can take the photo with the bride at first? It is a crazy idea indeed. 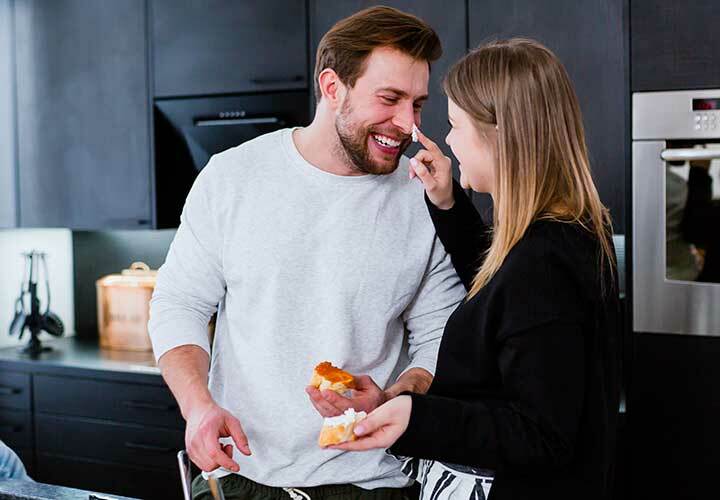 Cook an interesting dish together and feed each other in romantic ways. This is a fun thing that every couple must try. If Zodiac signs are your love, then this is an interesting game to play together. Try to match each other’s compatibility and have some fun. Make sure to not take these things seriously. Try to whisper something romantic inside her ears and look at her expression. Doing these type of intimate things in public is not easy for sure. But hey! That’s the fun. While having a deep conversation, just simply pass this note inside her handbag and let her disclose it later on. We just love this idea. How many times can you tell her that you love her with all your life? Well! Let her count that. This is one of the sweetest things to do with your girlfriend. She is your love of life, so do something grand. Always tell her that how special she is in your life. All these things to do with your girlfriend are perfect for lazy weekends. Bring back the positivity, romanticism, love, passion, and motivation to your life. We are sure that these ideas would help you. Make her feel comfortable with your ideas and gestures. Don’t do something horrific or inhuman. Have a clear idea about her likes and dislikes. We feel amazing when you ask for more. Well! Let’s present a bunch of interesting contents that would surely make your day. Dating Tag Questions: Feel romantic with this awesome question-answer game. Know your partner more than before. Girlfriend Tag Questions: Tag questions are just the perfect to have fun and to know another person. This bunch of tag questions is just the perfect everyone wants. Good Questions to Ask: Sometimes, to initiate a conversation, all you need is a bunch of good questions. Check these out. Conversation Starters for Couples: Well! From now on, you would not find any trouble to strike a chit-chat with your partner. This list of 50 topics is just the perfect starters of all time.